Each year, the WJEA seeks to recognize some of Washington’s top educators and students through a variety of awards. Most applications are available for download as PDF files, which require Adobe Acrobat Reader. One journalism senior (newspaper, yearbook or broadcast) is awarded this honor, plus $2,000 is applied to tuition at the college of their choice. Advisers of all applicants must be WJEA members. One journalism senior (newspaper, yearbook or broadcast) is awarded this honor, plus $2,000 is applied to tuition at the college of their choice. The winner is Washington’s entry into the JEA National High School Journalist of the Year competition. Advisers of all applicants must be WJEA members. 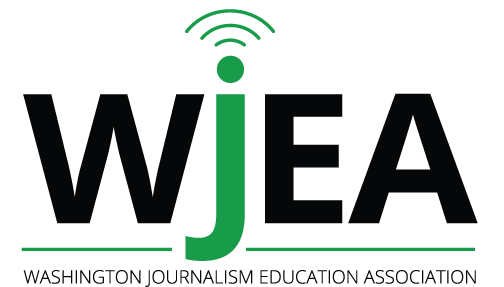 WJEA Summer Workshop study grants in journalism are awarded to students in grades 8-11. One adviser (newspaper, yearbook or broadcast) receives a $500 cash award for fighting censorship issues and maintaining student free speech. Only members are eligible. Members may apply for a $750 study grant to attend a summer workshop. One grant is given to an experienced adviser and one to a new adviser with three or fewer years of service. From nominations made by student editors and/or principals, a committee chooses the outstanding advisers, who are announced at the spring conference in March. Only members are eligible. The purpose of the WJEA Administrator of the Year Award is to publicly acknowledge educational leaders who distinguish themselves through their exemplary support of journalism in their learning communities. Members are encouraged to nominate school, district and other school administrators for this annual award. This is the highest honor given by the Washington Journalism Education Association and recognizes a member for extraordinary achievement in improving scholastic journalism in our state. Recipients for this award are nominated by members through the board. 2018 – Tom Kaup, Auburn High School – Tom Kaup, MJE, and his students are credited with inspiring Senator Joe Fain to sponsor the effort to pass Scholastic Press Rights legislation in Washington state, an effort that was successful. This success came after several previous attempts to pass similar bills in our state. 2012 – Joy Lessard, Ellensburg High School – Joy Lessard, who advises newspaper and yearbook at Ellensburg High School, has trained countless new advisers during her Beginning Advising session at WJEA summer workshops. Lessard is now retired, but continues to participate in the national JEA Mentorship Program, and continues to work with new advisers year-round.